This article investigates the impacts associated with the introduction of a Geographical Indication registry in a network which operates within the wine agroindustrial system in the South of Brazil. The network is formed by wineries, grape growers, hotels, restaurants and artisans. Within this complex system, several collective actions take place, highlighting the introduction of a Geographical Indication (GI) registry for fine wines. Although the GI was supposed to affect the many actors of the collective system, its actual impact is unknown. 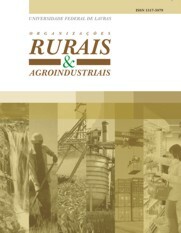 Thus, this study aimed at identifying: (i) whether the GI enables the creation of value for the different agents which operate within the agroindustrial system, and (ii) how the appropriation of value generated by the GI occurs. Based on interviews and questionnaires conducted with wineries and grape growers, the authors performed panel estimations. The main results point to a scenario of value creation in the investigated network. Regarding the value appropriation, the estimations suggest that the wineries are capable of appropriating greater created value within the network.